Brazil World Cup 2014 is well under way, and fans will be wondering about the wives and girlfriends (WAGs) of the various soccer superstars. Netherlands midfield star Wesley Sneijder is married to Spanish-Dutch actress and television host Yolanthe Sneijder-Cabou. 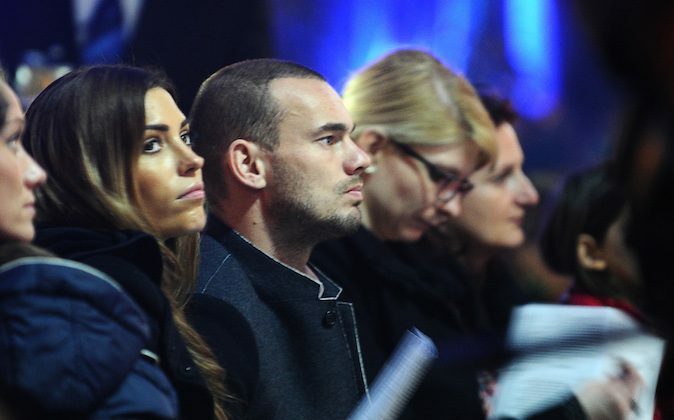 Previously, Sneijder was married to Ramona Streekstra from 2005 to 2009. Wesley and Yolanthe started dating in August 2009, just after Wesley finalized his divorce with Ramona. The couple married in July 2010, and do not have any children of their own. Wesley has a son from his previous marriage. Yolanthe co-founded the Stop Kindermisbruik Foundation, which helps to fight against child abuse in developing countries. Check out an AP article of the Netherlands and Australia match. PORTO ALEGRE, Brazil (AP) — The key question for most ahead of Netherlands’ second World Cup match is whether Robin Van Persie and co. can possibly top their stunning opening performance. The opponents this time is Australia, a much easier prospect than defending champion Spain, which it thrashed 5-1. Van Persie set the tournament alight with a memorable, diving header. The Dutch had modest expectations going into the World Cup. Their win against Spain has changed that. The Dutch know that a win would leave them well-poised to top Group B — an especially prized spot given that the runners-up in the section can reasonably be expected to face host Brazil in the second round. It would almost certainly condemn Australia’s team of mostly newcomers to an early exit, in line with the gloomy pre-tournament predictions. Netherlands manager Louis Van Gaal confirmed his reputation as a master tactician against Spain, playing five defenders and making the most of counter-attacking opportunities. Van Gaal hinted he might revert to the traditional Dutch 4-3-3 system against Australia. For Australia to stand a chance on Wednesday afternoon in the southern city of Porto Alegre, the Socceroos’ all-time leading scorer Tim Cahill will need to again be at the peak of his game. Dutch midfielder Nigel de Jong, who knows Cahill from when both played in the Premier League, said the New York Red Bulls’ striker was one of the best headers of the ball in the game. The 34-year-old Cahill’s header provided Australia’s only goal in the 3-1 loss to Chile. The quality of the opposition always meant Australia was going to struggle in Brazil. The country has a history of gritty performance against stronger teams, and has shocked one or two bigger nations, but most of the larger upsets have come in friendlies. Still, the players and coach believe, with some justification, that the score against Chile didn’t tell the whole story. Down by two goals in the first 15 minutes, Cahill’s 34th minute goal triggered a comeback that had the South Americans on the defensive for much of the second half. Chile’s third goal came in injury time. Australia coach Ange Postecoglou was handed a blow when attacking fullback Ivan Franjic tore a hamstring in the Chile match, ending his tournament. That has led to further upheaval in a defensive lineup already very much in transition and now facing Manchester United’s van Persie and Bayern Munich’s Arjen Robben.